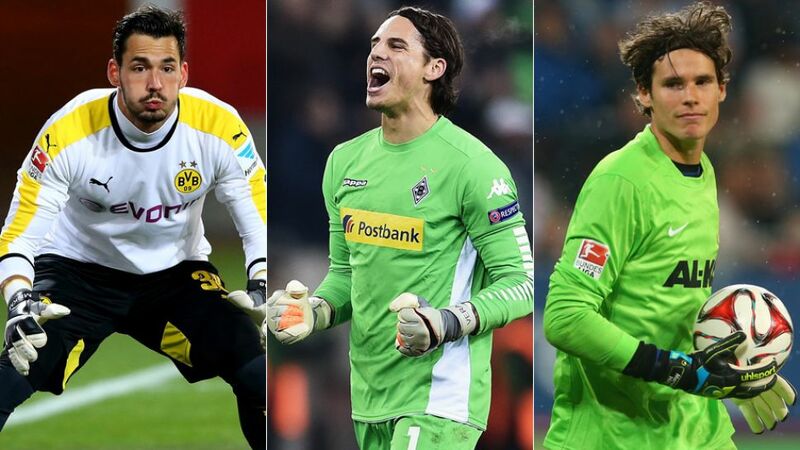 Roman Bürki (l.), Yann Sommer (c.) and Marwin Hitz (r.): Switzerland are spoiled for choice in goal. Selecting a first-choice goalkeeper for a major tournament is a headache for any national team coach, but Switzerland boss Vladimir Petkovic can rest assured that whoever he chooses will be up to the task: all three custodians in his 23-man UEFA EURO 2016 squad are established Bundesliga stoppers. After VfL Wolfsburg goalkeeper Diego Benaglio stepped down from international duty with the Nati, Petkovic has relied on Borussia Mönchengladbach's Yann Sommer, Borussia Dortmund's Roman Bürki and FC Augsburg's Marwin Hitz to fill the void between the posts. All three participated in European competition at club level in 2015/16, so their experience could be vital to Switzerland's hopes of success. "It's thanks to Mother Nature that we've got three great keepers," Switzerland goalkeeping coach Patrick Foletti recently said in a television interview. The competition for places is therefore all the more intense, even if Bürki and Hitz have had to come to terms with their roles as understudies for EURO 2016 for the good of the team. "I train hard but have to accept the coach's decision," said the Dortmund keeper. After all, they share a common objective: to get past Group A opponents France, Romania and Albania to qualify for the knockout rounds of a European Champions for the first time ever.